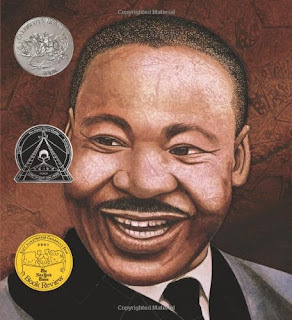 ABCs of Reading: Martin's Big Words: The Life of Dr. Martin Luther King, Jr. Chances are you’ve spent the last few days thinking about the year gone by and determining what was most important. Focusing on significant events from the past, just might help you better understand the future. It turns out that “determining importance” is a skill useful in life and in reading. Explain to your group that good readers are able to decide which words in a sentence or in a passage carry the most meaning. Direct the students to listen to the biography Martin’s Big Words to discover the most important words. After reading, ask students which words they thought were necessary to determine what was most important in the story. List the words on a chart. Then reread the book, stopping on each page to add to your list those words your students think are the most important. Explain that the author made her choice of Dr. King’s most important words to use in the book. To prepare for a poetry extension, type the words from the chart so that the words are fairly large and on one or two sheets of paper. For younger students, you may wish to put the words in dashed-lined boxes to create cutting guides. Duplicate a class supply of the pages. Provide each child with a set of the words to cut apart. Have him arrange his choice of the words onto construction paper to create a work of “found poetry.” After he has glued the words to the paper, invite him to share his poem with classmates. Display the poems along with a copy of the cover of the book or a picture of Martin Luther King, Jr.